The market did its best to put investors to sleep on Tuesday, underwhelming even the most conservative of traders. It was like a trading session straight out of summer where managers, investors and seemingly every market participant is out of town. In any regard, we had enough movers and shakers to find a few top stock trades for Tuesday. A week ago we were covering the massive declines in Activision Blizzard (NASDAQ:ATVI), Take-Two Interactive Software (NASDAQ:TTWO) and Electronic Arts (NASDAQ:EA). At the time, we noted the heavy volatility and so far, that volatility has continued. As EA goes between sinking ship and rocket ship, ATVI stock is breaking to fresh lows on reports of a big layoff. The move comes just a day before Activision reports earnings on Tuesday after the close. Some investors may be tempted to go long, but the fundamental situation continues to be a mixed bag. It would be hard to get a panic sell down to $35, but if we do, that 12.5% drop could trigger a wave of buyers. If so, that could put in a capitulation bottom, attractive for longer term investors. Let’s see how it trades ahead of earnings and post-results. This one has been choppy lately, but I still think Under Armour (NYSE:UAA) is setting up nicely. Nike (NYSE:NKE) and Lululemon (NASDAQ:LULU) continue to push higher, so the industry momentum is there. I love that UAA is holding up over all of its major moving averages. The bounce off the 21-day and 50-day moving averages is encouraging and if we can get some more traction, I want to see UAA get into that December gap. If it can, it could fill up to $22. The only wild card? Earnings, which are due up on the 12th. 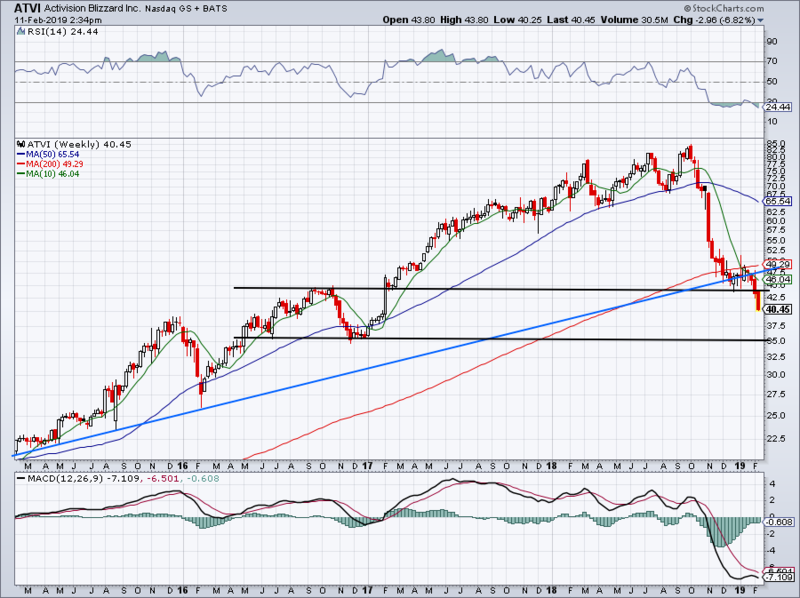 If the move is lower, look for support on the backside of prior downtrend resistance, near $18.50 to $19. On a rally, look for a close over $22 and for that level to become support going forward. A move over $22 could trigger a rally to the highs near $24 to $25. Software stocks have been red-hot, and Shopify (NASDAQ:SHOP) isn’t sitting out any of the action. 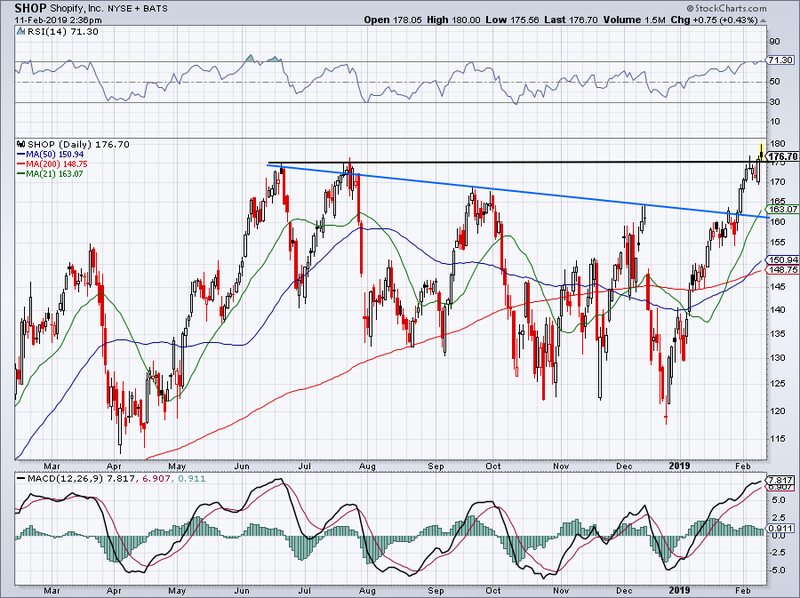 The stock made new all-time highs on Monday and is buoying over this $170 to $175 area nicely. 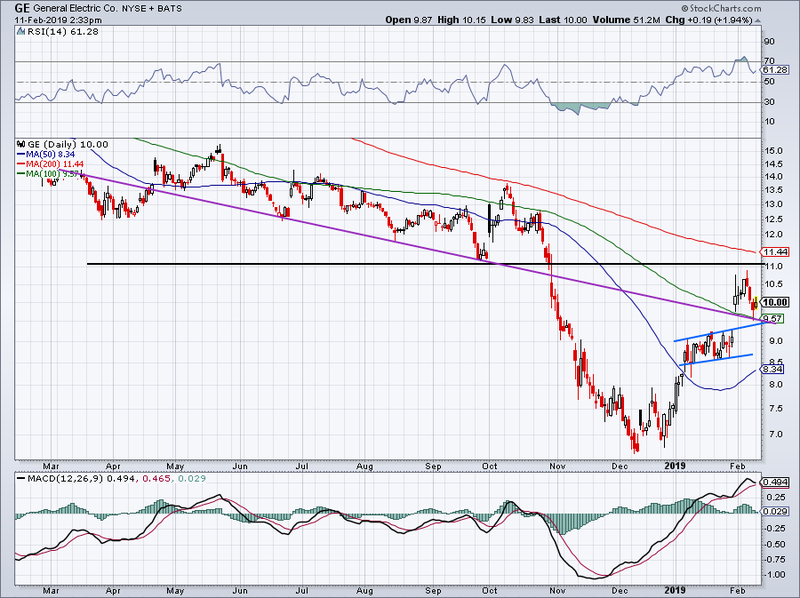 Mainly though, I want to see SHOP hold up over prior downtrend resistance. That’s a wide range, admittedly, but this is a volatile name. Conservative traders can use the 21-day moving average as their line of reference if they feel more comfortable. Use caution though, as Shopify will also report earnings on the 12th. Holding up over the 100-day moving average though and GE still looks okay from the long side. Admittedly, its fundamentals are still mixed, but from a trading perspective, bulls can justify a long position over $9.50. A close below this area would change the rhetoric. Shares of Roku (NASDAQ:ROKU) took an early beating on Monday, falling more than 6% at one point. With a relatively calm market, finding a catalyst was somewhat difficult, although many are now pinning it on a negative report from Vertical Group. Roku shares have pared some of those losses, now down just 3% on the day. 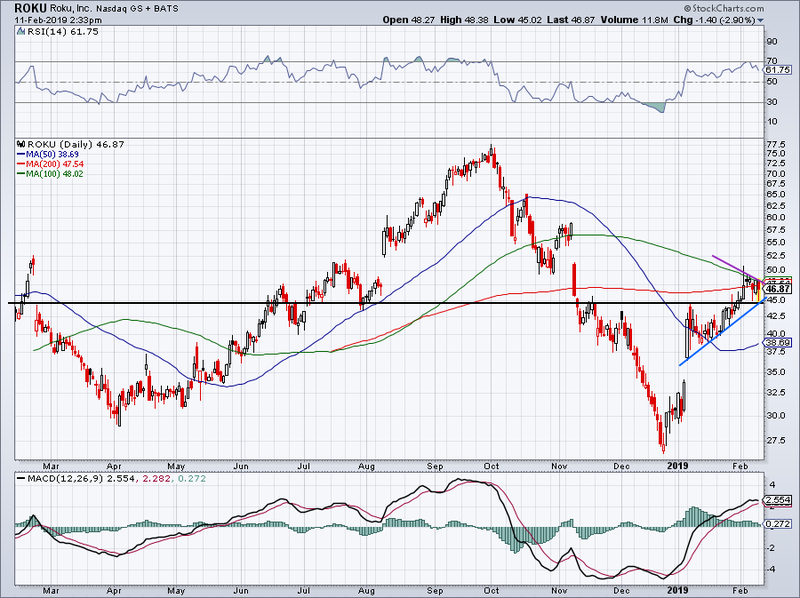 The recovery has kept ROKU’s charts intact, albeit, somewhat less bullishly than before. The 100-day moving average and short-term downtrend resistance (purple line) continue to keep this one in check. As long as Roku stays above Monday’s lows, bulls are okay. 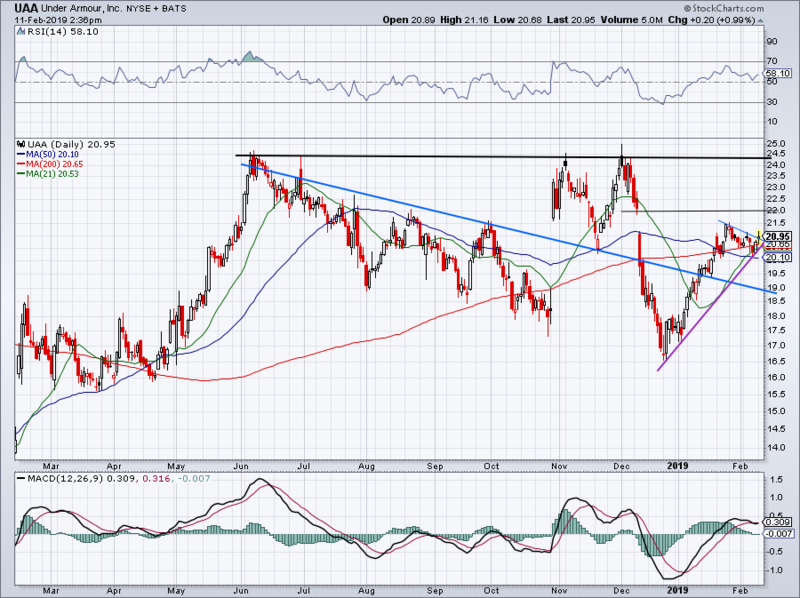 ROKU stock could certainly break down, but currently, it looks like a breakout to $50+ may be brewing.